tend to be simpler than methods used in Medieval, Hellenistic, Vedic, and Harmonic astrology but there are many details that can be an important to an astrologer who uses modern methods. Some of these are described below. A Chart Wheel Just Like You Want It! Kepler includes many chart wheel styles and the easy customizing of chart wheels makes it possible for you to have the chart wheel just the way you want it. Whether you want Chiron, True Node, True or Mean Lilith, Eris, Sedna or some other asteroid in a wheel, you can do it in Kepler. There are so many options and so much flexibility that you can get the information the way you want it. Modern astrologers excel in producing interpretations that capture personal characteristics and behaviors in colorful and accurate ways. The interpretations included in Kepler continue this modern tradition. These are not dry and stale interpretations. They are written by astrologers who not only have mastered all of the subtleties of interpretation but who write extremely well. The result is that the reader gets fully absorbed in reading the interpretations. The Cosmo Natal Report is available in many languages. We are now in an information age and there is a global community. With interpretations in different languages you can produce interpretations that your clients will appreciate having in a language that they are most fluent in. Time Line Format Forecast and AstroSignature Forecast! Kepler uses modern ways of presenting information so that you can quickly see what is happening. You no longer need to scroll through text listings or look at hard-to-read time lines. This time line is wonderfully easy to read and easily customizable. Calendar, Treasure Maps, Online Chart Service, Art Wheels, Research and More! As you browse through this website and see all of the features available in Kepler, you realize that you have access to so many features that you are only limited by your imagination. We are only skimming the surface of features that the modern astrologer can use to work faster, more efficiently, and more effectively. 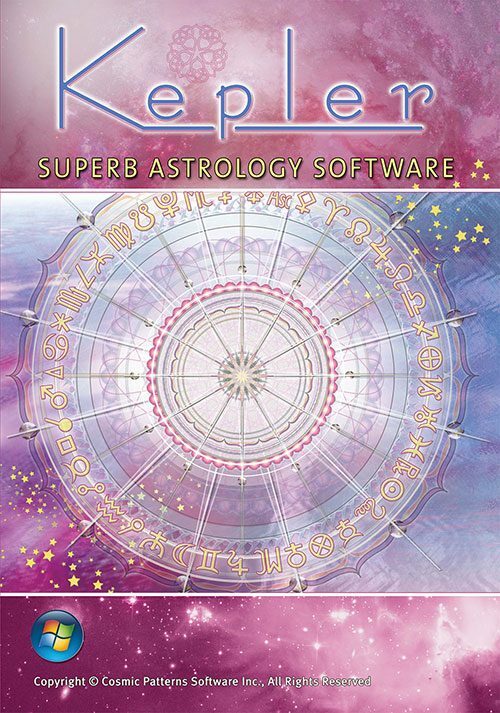 Whether you are a beginner, intermediate student, or advanced professional, you can use Kepler right away and as you grow and develop in astrology, you will find that Kepler continues to provide tools that you can use. Listed below are some of the Medieval Methods in Kepler. You will find these described in more detail as you browse through the features of Kepler on this website. These chart wheel styles include tables of essential dignities, sect, almutens, conjunctions to fixed stars, and other information that medieval astrologers use. There are three different default medieval wheel styles and you can customize them. This table lists when aspects were exact or will become exact or if the aspects do not become partile. This is very helpful for the horary astrologer. There are several variations of essential dignity tables provided and you can customize the tables. You can also include all three triplicity rulers in the essential dignities table. Some of these features are described and samples are given in this website. If you would like to see a sample of any of these tables, let us know and we will add samples here. We are briefly summarizing some of the medieval features that are available and gradually we will add more samples of features so you can see them. 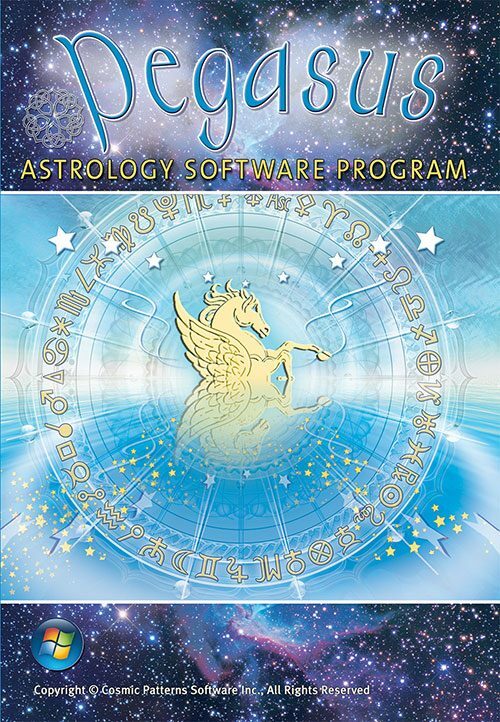 One Day AstroSignature Forecast and Electional Astrology Grpah with Classical rules. You can pick dates based on changing planetary hours, rising signs, essential dignities etc. and see the results graphically. Also available as an option are talisman images from the Picatrix that can be used at times when the graphs peaks and a planet is at greatest strength. Kepler is a complete and comprehensive Vedic program. 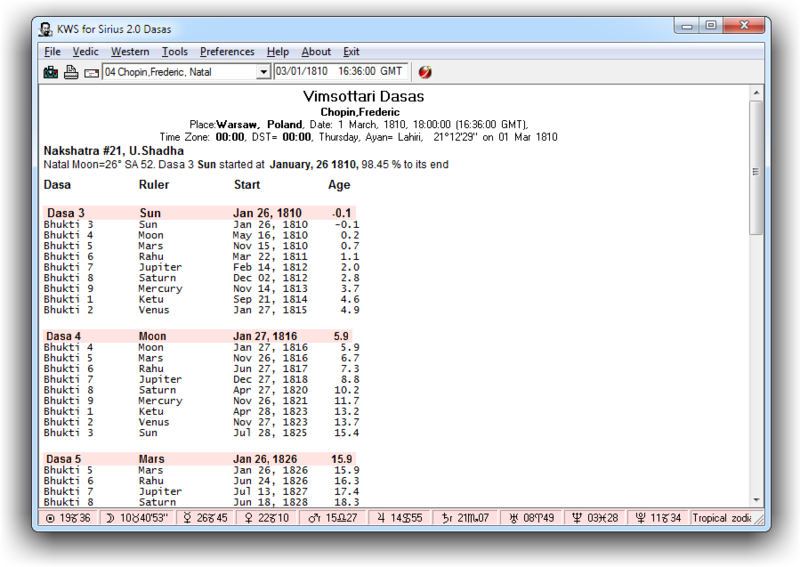 Any Vedic program allows you to select vargas, but Kepler shows them in a resizable window that makes it easy for you to see the vargas while also seeing other information in tables. Vedic: Dasas, Gochara, Muhurta, etc. 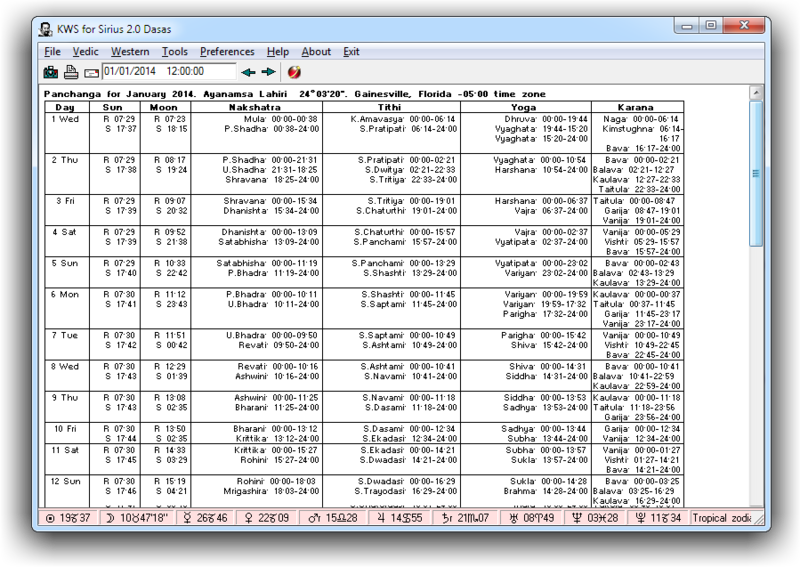 Many Vedic forecasting methods are available in Kepler. In addition to the most common dasa system, Vimsottari dasas, there are 9 other dasa systems: Ashtottari, Drigdasa, Kalachakra, Lagan Kendradi, Narayana, Narayana Shoola, Shoola, Sudasa, and Yogini. You can select the number of levels. Ashtakavarga tables and an ashtakavarga graph are available as well as a Gochara graph. The panchanga forecast tables are very nicely organized and are thorough. A huge number of muhurta tables can be produced and the muhurta tables include graphic images at the top of the report so you can send to clients, post on your website, or publish beautiful and unique muhurta tables. Of course, the technical accuracy is just as professional and carefully developed as the beauty of the reports. If you click on the images to the right, you will see the attention to detail that is given to each report. 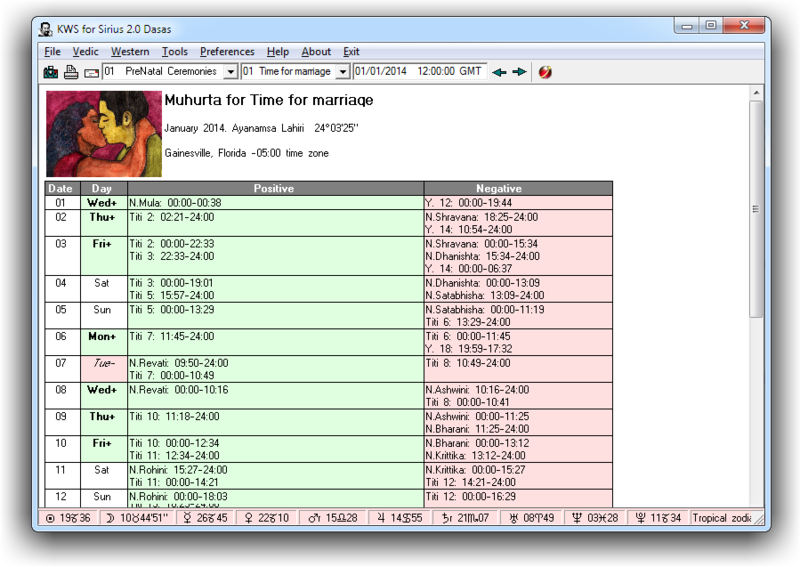 The inclusion of lots of technical detail in a nicely organized and clearly readable manner, the use of background colors, and the graphic image at the top of the muhurta tables are examples of how Kepler not only provides the information that you would like to have, but provides it in a very professional and beautiful manner. As usual, you can right-click on a report to quickly pull up the settings. For example, while viewing the dasas listing, you can right-click, change the kind of dasa, the number of levels, and any settings that are specific to that kind of dasa, click the OK button and see the new listing. We have also carefully compared and analyzed the results produced by Kepler with authoritative sources. The extreme effort that we put into ensuring that Kepler is technically accurate, flexible, easy-to-use are reasons why astrologers who work with Kepler are invariably impressed and delighted. Shad bala, upagrahas, bhava arudha, special Lagnas, and sahams are just some of the information that can be listed. 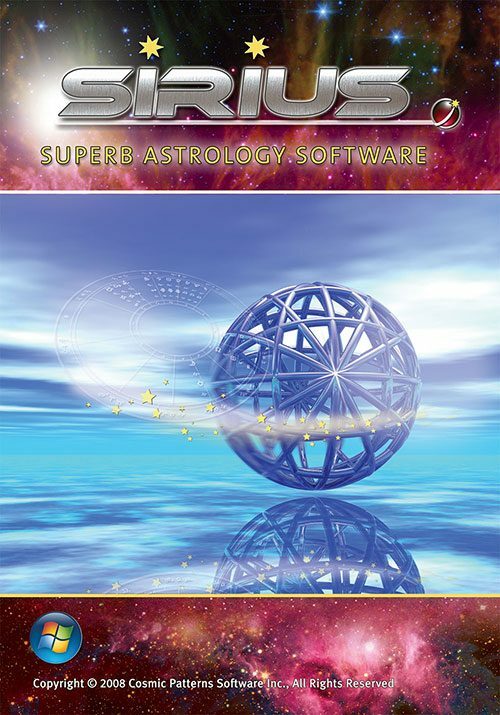 Many of these features are implemented very so thoroughly and clearly that some Vedic astrologers are amazed when they see this and are surprised with the level of refinement and precision that is provided. 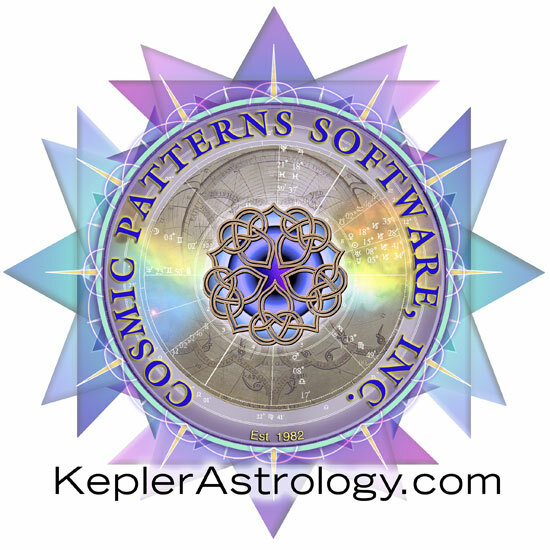 A beautiful, simple, and clear presentation of information for KP astrologers is also available in Kepler.